Source: Spirit of the American Doughboy Statue, Nash County Courthouse, Nashville. Photograph courtesy of Documenting the American South. Rendered in pressed copper, this statue depicts the slightly larger than life image of the American Doughboy soldier in World War I in honor of the service and sacrifice of soldiers from Nash County. He stands atop a square tapered granite pedestal which itself rests on a square stone base. The soldier stands upright, in the process of taking a step, with his rifle with an attached bayonet in his left hand and his right arm raised holding a grenade. He is dressed in the combat attire of the common soldier of the period, wearing the classic, flat and wide-rimmed helmet. A bronze plaque anchored on the rough cut stone pedestal bears the inscription in raised lettering and a bas-relief image of the American eagle, with its wings outstretched and perched in the center of four crossed flag poles with draped American flags. The unveiling and dedication were planned for November 11, 1921, Armistice Day. The day prior to the event, The Graphic, Nashville's local paper, ran a story listing the planned events. The ceremonies were to begin at 10:30 in the morning with a parade. The services would be lead by M.W. Lincke, with the invocation by the Rev. Eugene C. Few and presentations and addresses by Lieutenant Archie Odom, the Hon. F. S. Spruill, the Hon. S. F. Austin, Sergeant I. T. Valentine, former Governor Thomas W. Bickett, and a benediction by the Rev. Edgar White. The event continued throughout the afternoon and evening with music, more addresses, and an evening pageant staged in front of the courthouse by Mrs. Annie B. Dozier. The list of participants in the parade included Nash County school children, members of the American Legion, ex-service men, members of the Nash Camp of Confederate Veterans, the United Daughters of the Confederacy, Junior Order of the United American Mechanics, and numerous decorated automobiles and parade floats. The event also included an aerial exhibition by a plane from Fort Bragg. This statue is one of some 140 World War I Dougboys made by Viquesney that are still standing, most made from pressed copper. On the November 11, 1921, the date of unveiling of the Nash statue, another copy was dedicated in Americus, Georgia where Viquesney created the Doughboy. Viquesney mass-produced the statues and corresponding collectible miniatures from the 1920s to the 1940s, with the World War I Doughboy becoming perhaps his most well-known creation and securing his renown as a sculptor of World War I and World War II soldier figures. See Spirit of the American Doughboy in Charlotte and World War II Memorial in Belmont. "Doughboy" was a familiar term for a common soldier from the Army or Marines, used particularly in reference to World War I servicemen. The name of the sculpture, "Spirit of the American Doughboy," evidences the spirit of youth, confidence, and endurance brought by the young American men to the front in Europe. They endured long and depressing voyages across the Atlantic only to face the physical and emotional extremity of war and life in the trenches. 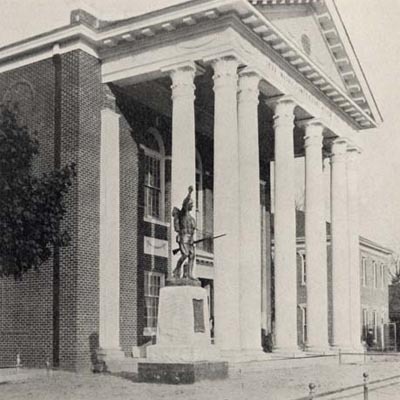 The monument sits on the left side of the entrance to the Nash County Courthouse on North Washington Street and faces south. The monument is located in the lawn area just to the left of the pillars of the entrance to the courthouse. A brick walkway leads to the monument from both North Washington and North Drake Streets and frames a circular garden area next to the statue. The Nash County Korean War memorial plaque is located nearby on the brick face of the courthouse.